Can’t watch another minute of election coverage. Gonna cook! | Arthur in the Garden. ← For the love of Wired Wednesday! Can’t watch another minute of election coverage. Gonna cook! I can’t watch another minute of election coverage! Lets see what’s in the kitchen. Hmm. White wine reduction sauce. Onions. Garlic. Spices. 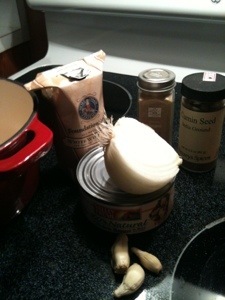 How about French onion soup or more like an “Indian Onion Soup”? 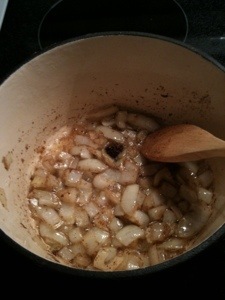 1) Begin with sweating the onions in oil. I love that phrase but basically you are just sauteing or softening them. About 15 minutes. 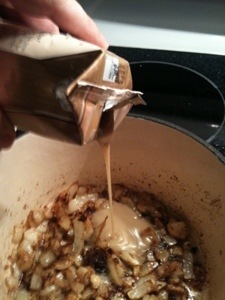 2) Add the white wine reduction sauce. A half cup of water and stir to incorporate and cook for about 25 minutes. I also added turmeric, ground cumin, a green cardamom pod, and a dash of ground red pepper. 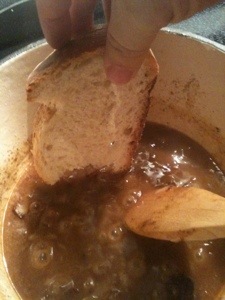 3) I had to taste test it with some French loaf. It was so yummy. The white wine reduction sauce was almost as flavourful as Marsala. The spices added some extra flair. 4) Ladle into bowls. Top with a slice of French bread. Sprinkle some shredded cheese on top. I also sliced the last cherry tomato from the garden and placed it on top! 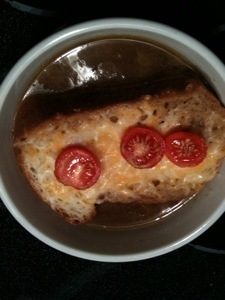 5) Place the bowl under the broiler to melt the cheese. 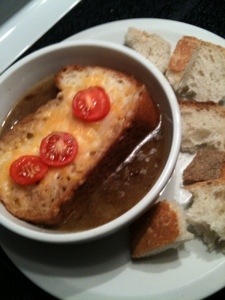 Serve with torn bread on the side to sop up that wonderful broth! Ahhh. I think I will avoid all election coverage and just watch some gardening or nature programs. Check in with me in the morning after I find out the results. I might be moving to Canada or Israel where they are more progressive with healthcare and social issues! I avoided election coverage until the last hour or so. It cut down on the craziness.